We will be hosting two separate six day workshops. The first workshop will be from March 7th to March 14th, the other workshop will be from April 18th to April 25th. This event posting is for the March workshop, but you can also find our other workshop event posting on this website. 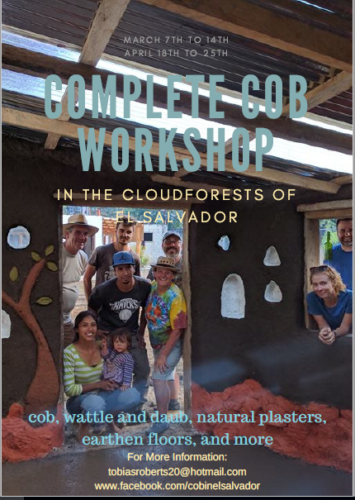 Marth 11th Creative/Artistic opportunities for sculpting, creating niches and other means to enliven your cob structure. March 14th Return to San Salvador Airport. Flights leavings no earlier than 11 AM.